To help members through common research roadblocks, we've added several new video tutorials to Archives.com. 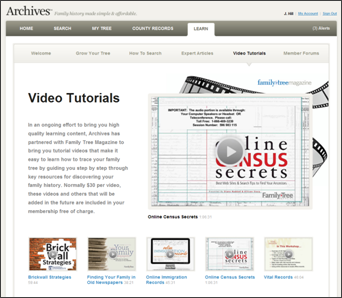 The videos are made available to members by Family Tree Magazine, America's #1 family history magazine and creator of Family Tree University. Each video tutorial averages around 45 minutes of helpful tips, and will assist you break through brick-walls, find vital records, immigration records, old newspapers, and more! To watch a tutorial video, log in to Archives.com and go to the "Learn" tab. Click on the "Video Tutorials" icon to preview the videos available. The folks at Family Tree Magazine have done a phenomenal job creating these videos. The presentations are easy even for beginners to follow, but provide information that will be useful to family historians of any level. If you like these videos, Family Tree Magazine has published many other video tutorials available here. We encourage you to check these out, and browse additional offerings available at Family Tree University. Adding these video tutorials is part of Archives' ongoing effort to bring members premium resources. Don't hesitate to take advantage of this great opportunity to bring your research to a whole new level. Get started watching video tutorials at Archives.com now!